Normal soap bubbles are made of a thin liquid layer around a gas bubble. Antibubbles are like reverse bubbles, where a layer of gas surrounds a liquid sphere. They are a common occurrence, but you may not have noticed them. Antibubbles can either skitter across the surface of a liquid or they can be submerged under liquid. These bubbles appear bright because they refract light back toward its source, similar to how water droplets in a rainbow refract light. There are a couple of ways you can make and observe antibubbles yourself. 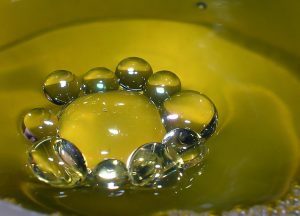 One method is to drip water from a faucet into a container of water to which a couple of drops of soap have been added. The soap lowers the surface tension of the water so the film of air surrounding the dripping water can persist long enough to see the antibubbles. Pour a couple of teaspoons of sugar into a glass of soapy water. Do not stir the sugar. Give it a few minutes to dissolve. You want a dense layer of sugar at the bottom of the glass. Use a drinking straw to drip a sugar solution into this glass. The droplets will form antibubbles that will sink toward the bottom of the glass. Though the antibubbles will pop if they touch the sides of the container, they will rest on top of the sugar layer at the bottom of the glass and may last for several minutes. There is a technique to this. I was able to get a couple of antibubbles to sink toward the sugar layer, but I had much greater success forming antibubbles (as well as normal bubbles) on the surface of the liquid in the glass. I got the most antibubbles by pouring a thin turbulent stream of sugar water into the glass, not adding the liquid dropwise. Another technique is to repeatedly dip the open side of a glass into and out of a dish of soapy water. 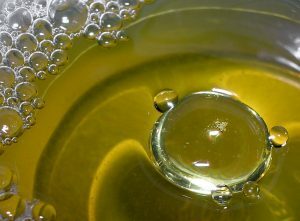 You can also look for antibubbles in everyday liquids. They often form in beer or soda. Watch for bright bubbles that may rise slowly to the surface.